Born in Catalonia at Verdu in 1580, he studied with the Jesuits and later became a Jesuit himself. Before he was ordained in Cartagena he sailed to Colombia in South America to help the indigenous people. As a priest he made a special vow to evangelize and give all assistance possible to the African slaves. 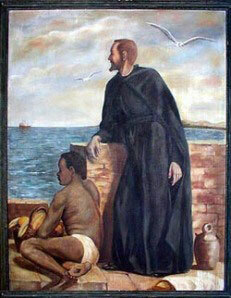 Saint Peter Claver is protector of slaves and missionaries among the African peoples. For devotional items related to the Catholic Church please visit Lynn's Timeless Treasures.